The list of people arrested and detained by the local police forces for organising solo protests in favour of Tibetan freedom is consistently growing. This tendency clearly contradicts Beijing’s recently released white paper, which claims that Tibet has reached its ‘golden age’. Two Tibetan monks launched separate protests challenging Beijing’s rule in Sichuan province’s Ngaba county on Thursday [10 September 2015] following similar solo protests by two other monks in the area earlier in the week, sources in the region and in exile said. Both were quickly overpowered by police, with at least one being beaten after being taken into custody and bystanders who shouted in support of his protest also reportedly detained, sources said. Lobsang Drakpa, 20, also known as Adrak, staged his protest in Ngaba (in Chinese, Aba) county’s main town on Sept. 10, calling loudly for Tibetan freedom before he was taken away, a local source told RFA’s Tibetan Service. “Local Tibetans who witnessed the scene raised cries in his support,” RFA’s source said, speaking on condition of anonymity. Separately, a second local source confirmed that the monk had been detained. 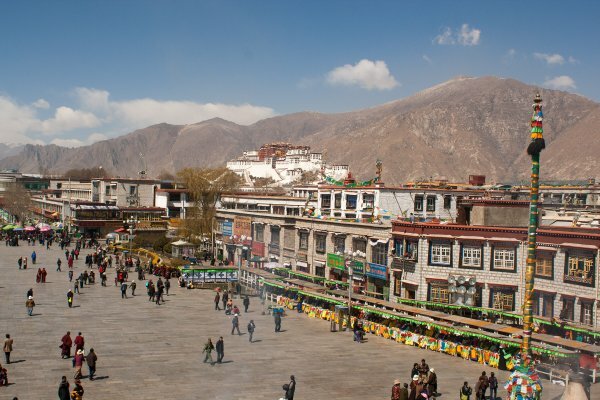 “It is true that a monk of Kirti monastery protested in Ngaba town,” the source said. “His name is Adrak. He is also known as Lobsang Drakpa, and his family are residents of Suruma township in Ngaba,” the source said, adding that a security clampdown was now in place in Ngaba, with authorities cutting lines of communication to outside areas. “When Lobsang Drakpa was taken away, some Tibetans who witnessed the scene clashed with police, but no details regarding injuries or detentions are known,” he said. Some in the crowd who fought with police may also have been taken away, though, Kanyak Tsering, a Tibetan monk living in exile in India told RFA, citing local sources. “Many were reported detained, but details are not available,” Tsering said. A nephew of Drakpa’s, Lobsang Tsultrim, was jailed in 2012 for allegedly supporting a self-immolation protest and is now serving an 11-year prison term, Tsering said. Also on Thursday, a second monk, also named Lobsang, launched a solo protest in the town at around 6:00 p.m., calling out for Tibetan freedom and the long life of exiled spiritual leader the Dalai Lama, Tsering said. “When police saw him, he was immediately detained and taken away,” he said. “A group of lay Tibetans in Ngaba town are reported to have protested his detention, but details cannot be confirmed,” he said. Thursday’s protests followed similar protests in Ngaba on Wednesday and Tuesday in which two young monks—Jampal Gyatso, 21, and Lobsang Kalsang, age unknown—also marched in the street, shouting slogans, before being taken into custody by police.